You do not need statistics to prove that African is amazingly doing well in the area of education. There is hardly any country on the continent with gold-plated opportunities, especially upon graduation. To that effect, post-learning life easily becomes an uncertainty, leaving scores of graduates joylessly roaming. But since Africans have consciously learned to transform very sour lemons offered them into aromatic lemonade, education has found a comfortable position in their living rooms. Consequently, the smooth rapport with education has placed Africans who have immigrated to the USA on a good footing. As time unfolds therefore, many Africans working in the healthcare sector are looking beyond just earning incomes as Nurses. They are increasingly getting concerned about Nursing education which constitutes a huge portion of learning, not only for immigrants but for Americans as well. In a country where healthcare needs keep increasing, there is obviously a rising need for workers in this sector and consequently greater need for education to that effect. There is therefore a conspicuous trend of young Africans who are emerging to contribute to this effort in educating the people who take care of the sick and in most cases, the elderly. Abduliny Conteh is a young Sierra Leonean with such a perspective. 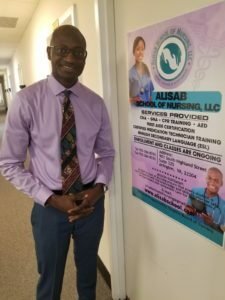 After mustering the courage to set up a Nursing school, he succeeded in doing so and today, ALISAB School of Nursing is a reality. To the Arlington, Virginia-based healthcare worker and nursing educator, there is nothing as fulfilling as empowering people in his community with nursing education. Of course, it is no news today that healthcare is the biggest consumer of workers in the USA and equally a sector that needs adequate attention. It is likely still going to be the case for years to come. If Africa for instance, has enjoyed its fair share of remittances over the years, it is largely thanks to Nursing – there is little doubt about that. Educating more people therefore, would just be a direct translation of development for the continent. Conteh got on the right track therefore. And so as we write, ALISAB School of Nursing has begun its own quota of history-making with classes ongoing on the Arlington, Virginia campus (address on the flyer). For one thing, Abduliny Conteh believes in making education the friendliest companion. It’s the same vision he has with ALISAB School of Nursing which he is clad in the necessary resources to give it an additional value in the healthcare industry. As you get ready to enroll, also find time this to listen to the founder of what is now described around the DMV as one of the best things happening to Nursing education – ALISAB. Abduliny Conteh, accompanied by his team, will be speaking live on Apex Snapshot this Saturday, June 30, 2018. The show will start at 5pm eastern time (11pm in Freetown-Sierra Leone) on www.apex1radio.com You are encouraged to call in at 614-772-2624, if you have questions for our guests. See you then!